SEUTTER - Nov' Orbis Sive America Septentrionalis. . .
SEUTTER, M. - Nov' Orbis Sive America Septentrionalis. . .
Nov' Orbis Sive America Septentrionalis. . . - SEUTTER, M.
Title : Nov' Orbis Sive America Septentrionalis. . .. Date : Augsburg, J.M.Will, 1778. Size : 10.2 x 7.7 inches. / 26.0 x 19.5 cm. 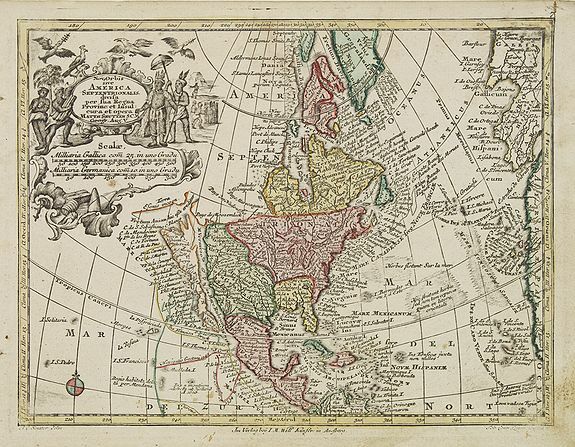 Description :Miniature map of North America, a reduction of the appropriate part of Seutter's folio map of the Americas, drawn by Albert Seutter. An unusual looking map, its projection giving the mainland and the Island of California (on the second Sanson model) in particular, a very exaggerated North-South dimension. The map is covered with place names and early explorations are depicted. From Atlas Minor, here published by Johann Martin Will, with his address in bottom center of the map. Condition : Paper slightly age-toned, and with mainly marginal spotting. Good impression.